Here’s a quick tour of our affiliate software. Please read on below to get started! Or, click here if you’d prefer a full demo. 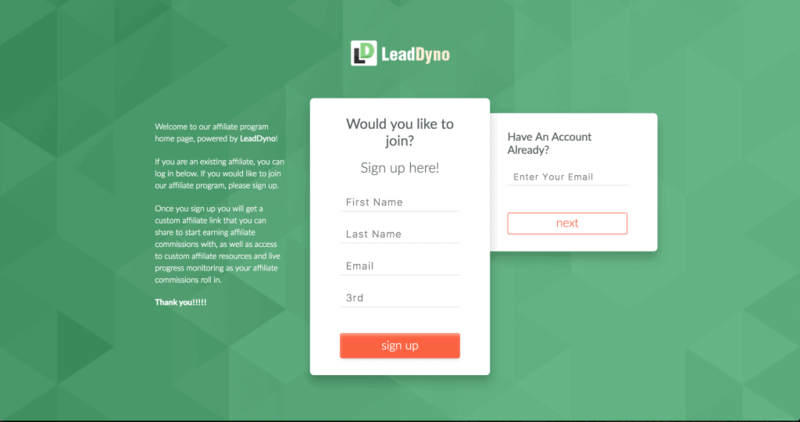 As soon as you sign up for your LeadDyno account, we’ll create an Affiliate Sign Up page for you. We host it for you at yourdomain.leaddyno.com. Here’s sample affiliate sign up page you’re welcome to check out. To get the code for your site, go to Settings – Tools – Affiliate Invitation Form. Of course, you can also sign up new affiliates and resellers via the LeadDyno app itself, too. For example, if you’re speaking with a new affiliate or reseller on the phone, you can just sign them up “on the fly” yourself – like this. And here’s a short video showing how to enable this feature. Now that we have your affiliates getting set up and ramped up with no effort on your part, let’s get them promoting your website!